The European Universities Badminton Championship 2017 was held in the green heart of Europe, in Ljubljana, Slovenia. More than 100 participants from 16 universities coming from 11 countries took part in the championship, participating in a combination of team and individual competitions. 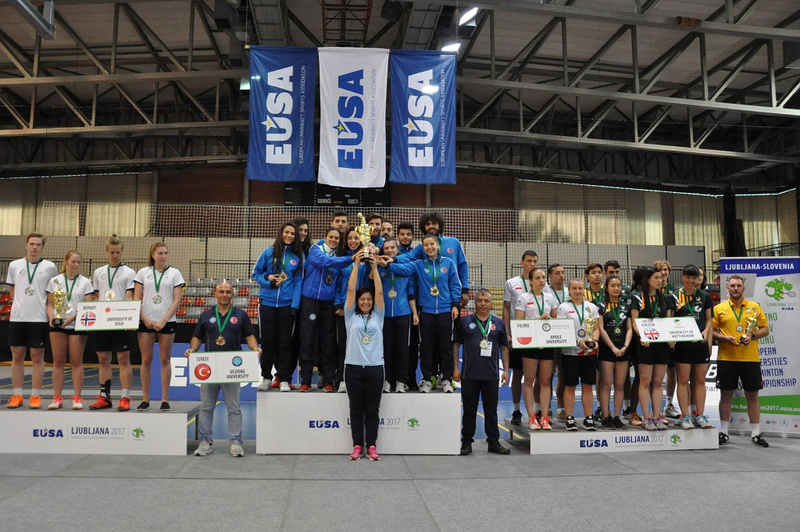 The championship was organised by the Slovenian University Sports Association (SUSA) and the Sport Association of the University of Ljubljana, and supported by EUSA sport partners, Badminton Europe. EUSA was officially represented by Mr Jean-Francois Sautereau, as member of EUSA Executive Committee, and by the technical delegate for Badminton Mrs Isabelle Jobard, assisted by Mrs Alison Odell. The team competition confirmed the supremacy of Uludag University (TUR), defending the title from the previous European Universities Championship (Warsaw, 2015) and from the last edition of European Universities Games (Zagreb-Rijeka, 2016). The individual competitions saw the athletes confronting in five categories: mixed doubles, women’s doubles, men’s doubles, women’s singles and men’s singles. The gold for women singles and doubles confirmed the leading position of Uludag University (TUR) and it was assigned respectively to Neslihan Yigit, and the duo Ozge Bayrak and Cemre Fere. In the other three categories’, gold medals were given to three different countries. The first place for mixed doubles was conquered by Pawel Pietryia and Aneta Wojtkowska from Opole University (POL). Whilst the gold for Men’s doubles and singles was respectively won by the duo Bruno Carvahlo and Tomas Nero from University of Lisbon (POR) and by Alexander Roovers of University of Duisburg-Essen (GER). A Special Fair Play Award was also assigned to the University of Nottingham (GBR). At the end of the championship, EUSA flag was passed to Ms Marianna Cardoso, representing the Organising Committee of the European Universities Games 2018, which will be held in Coimbra, Portugal. The next European Universities Championship will be organised in Lodz, Poland, in 2019. For detailed results, news and more information, please see the official website of the event at www.badminton2017.eusa.eu.